Lighthouses are marvelous things. 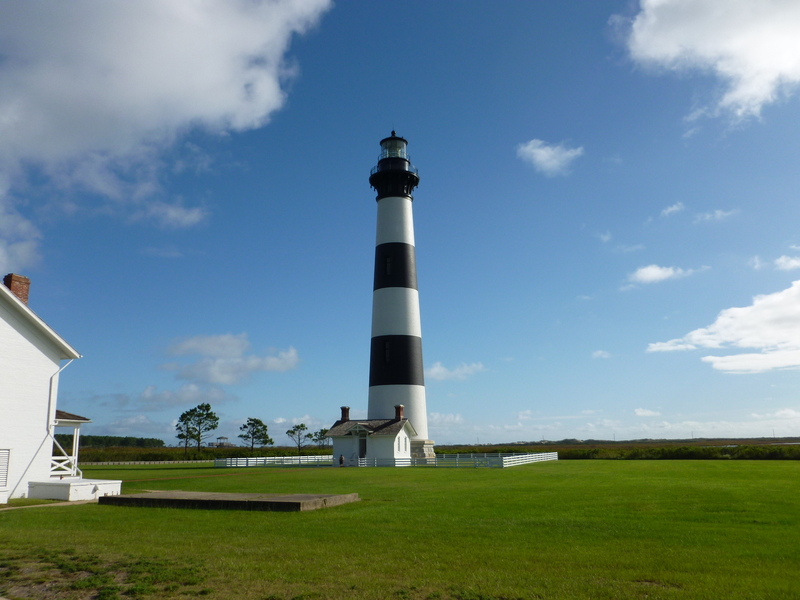 My new series, the Lighthouse Library Mysteries from Obsidian, is set in the historic (and real) Bodie Island Lighthouse on the Outer Banks of North Carolina. Because I live in the middle of a continent, and always have, lighthouses to me were never more than scenic buildings on windswept shores. As I’ve worked on the books, I’ve learned some of the history of lighthouses in general and the Bodie Island Lighthouse in particular. The first lighthouses were nothing more than buckets of flaming pitch hauled up to the top of a tall pole, to show fisherman or sailors the way home. These lights were essentially to help your family or villagers find their way home at night. But over the years the primary purpose of a lighthouse became to protect people one might never even meet. A ship, simply passing in the night. Imagine being on a leaky, creaky sailing ship. A dark night, a terrifying storm. A near, but not visible, coastline, dangerous currents and sharp rocks. 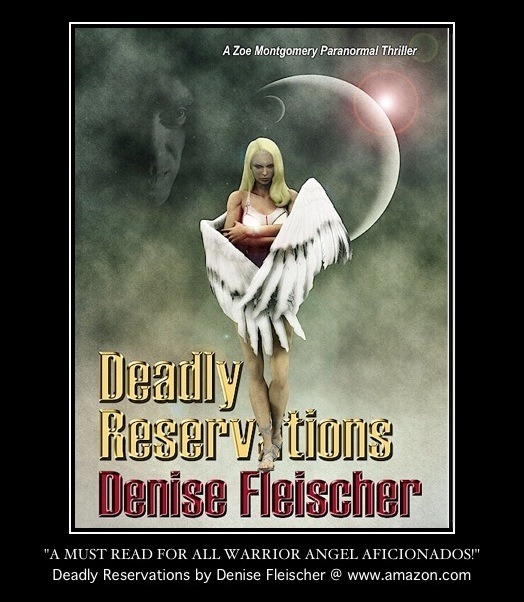 And then, visible though the dark, a brief flash of light telling you where you are, and what dangers to avoid. These days, with satellite navigational systems and coasts lit up enough to be seen from space, a lighthouse is little more than a quaint relic of the past. But they are marvelous places to visit, a reminder of the past, and I believe a true marker of civilization. 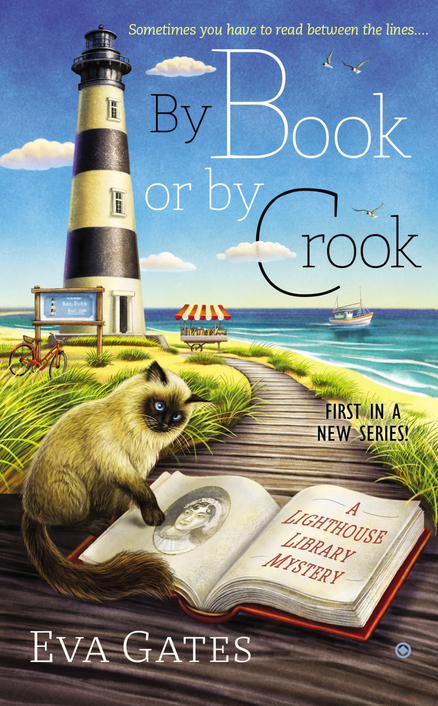 In By Book or By Crook, the first book in the Lighthouse Library Series, Lucy Richardson is having dinner with an old friend. “I see what you mean.” I smiled as I remembered my fourteen-year-old self. Part of the reason I’d liked Connor was that he didn’t seem at all like the boys back in school. Even then, Connor McNeil thought about things like lighthouses almost as much as he did baseball or fishing. Nice to see he hadn’t changed.